Welcome to the new Bunnies in Space story! 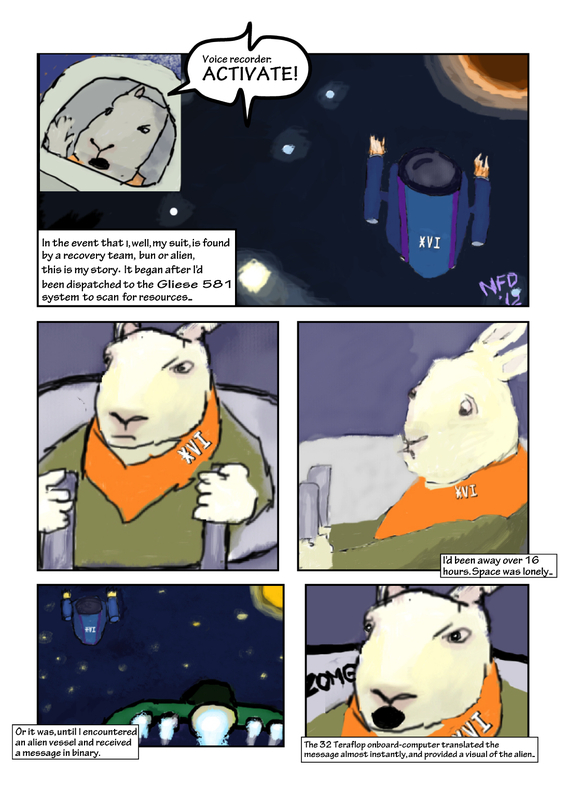 Panel 3: We see Captain Snowball in the round, domed cockpit; he’s a short-eared white/beige furred rabbit and a commissioned officer in the Bun Republic Scout Corps. He wears the olive uniform of the Scout Corps and the orange neckerchief of a Thumper pilot, marked “XVI”; his face is stern and serious of expression as both of his hands each grip a flight stick. Panel 5: Caption: “Or it was, until I encountered an alien vessel and received a message in binary.” Outer space view again. An alien spacecraft approaches the Thumper XVI! The alien ship, a heavy fighter, is a metallic green, and has two, long, downward-curving wings, a large bubble cockpit, and quintuple engines mounted in the rear; one big thruster at center, behind the cockpit, and two “child” thrusters on each wing. All told, the alien craft is nearly triple the size of the Thumper XVI. It’s closing fast, all 5 thrusters at maximum. Panel 6: Caption: “The 32 Teraflop onboard-computer translated the message almost instantly, and provided a visual of the alien…” Inside the Thumper XVI, Capt. Snowball’s mouth hangs ajar, a “ZOMG” quietly coming out. Note: A teraflop is 1000 gigaflops (floating-point operations per second). Given that the first teraflop consumer products debuted in 2007, that IBM broke the petaflop (1000 teraflops) barrier in 2008, and that Oak Ridge National Laboratory plans to debut a 20 petaflop supercomputer this year, and given that given that Moore’s law (that the computing power available inexpensively to consumers is doubling approximately every two years) continues to hold, it isn’t far fetched at all to assume a 32 teraflop computer on Scout Corps spacecraft when our story takes place (2051). In fact, I’m low-balling it intentionally to account for setbacks in human progress following a global great depression.